During our third visit to India, we watched the local kite festival from the rooftop of a family we visited in Ahmadabad. Our host was a lovely young woman who had run away to escape an arranged marriage, dodging her father and the police. (But that is a story for another time.) Everyone was looking up, watching the kites battling each other to see who would be knocked out to the sky. The kite strings are embedded with glass particles that can slice into another kite string and bring it down. The twilight was filled with people on other rooftops. All were hooking lanterns to their kite strings and launching them up into the sky. The dogfights began in earnest now to bring down one of these lighted beauties. I happened to glance down 3 stories and I caught sight of a young woman wearing in a purple sari and colourful head scarf. 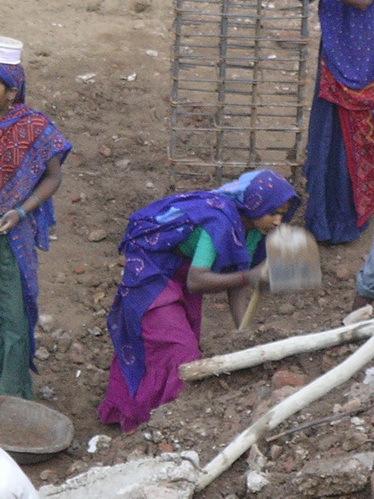 She was digging rubble into her head carrying-basket at the construction site next door. 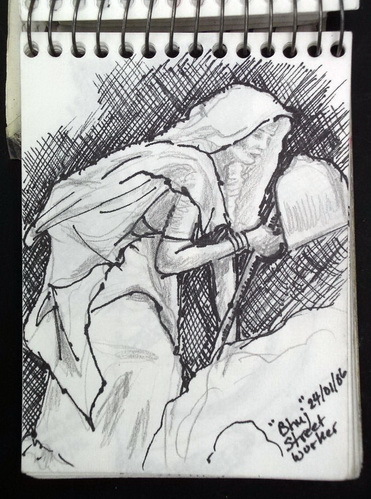 In the fast-fading twilight, I took photos of her, then sketched her in pencil as you see here. I later added pen and ink to the sketch to increase the value contrast between lights and darks. For the painting, the sketch had the wrong perspective. 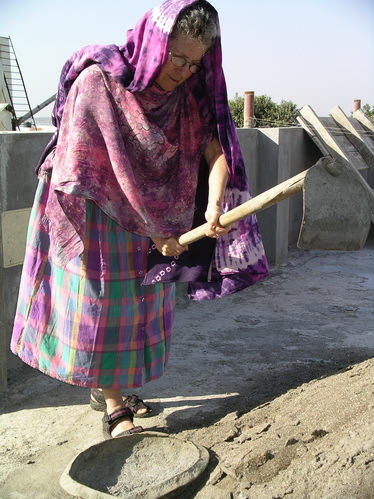 I wanted it at ground level so I donned a skirt, put my sarong over my head, and posed pretending to scoop up gravel. Don’t I look funny with grey hair, glasses and this strange outfit? 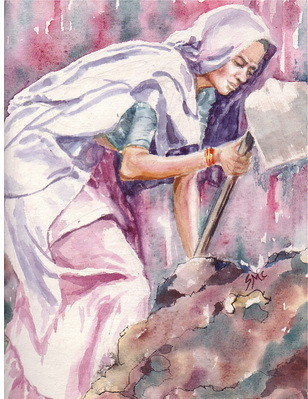 I created the watercolour painting shown at the left during our later travels in Gujarat. As a backpacker travelling for 3-4 months, I lug clothes, art supplies and finished work with me as I go. I work small, creating as many as fifty 9 x 12 inch watercolour paintings before returning to Canada. I can’t resist showing you one final image of a group of very young women waiting to haul cement up to a roof top on another project. Happy viewing, sketching and painting!